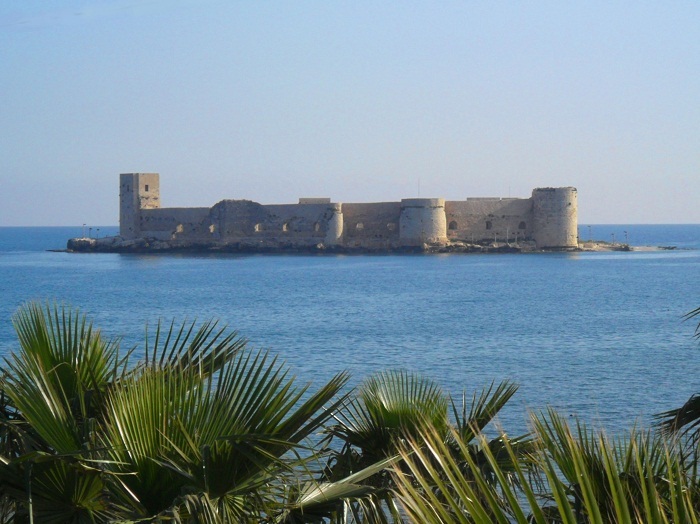 Korykos and Kızkalesi Castles, are castles that are located in the Republic of Turkey, where one is on the coast of the Mediterranean Sea in the Mersin Province, and another on a small island off the coast. The island standing at around 300 meters (980 feet) off the Turkish coast, it has an area of about 15,000 square meters (160,000 square feet), and it is mostly covered by the castle. 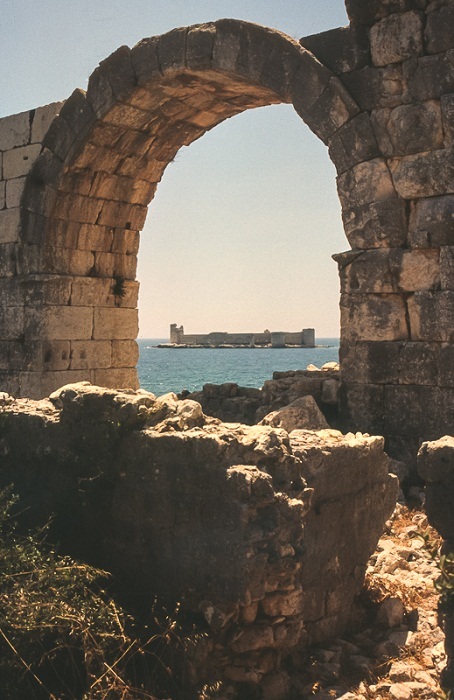 As Korykos was an ancient city in Cilicia Trachaea, Anatolia, it was an important harbor and commercial town that meant it has to be protected. It is not very clear whether the Byzantine Empire has built or rebuilt the castle, one thing is definitely clear, the Byzantine Emperor Justinian I have restored the public baths and the hospital. Since the coastal fortress needed some extra protection, in 12th century a supplementary castle was built on the nearby island. The legend says that a King once wanted to protect his daughter in captivity from a prophecy which was made as a prophesy that she will die from a poisonous snake. With hope that she will be fine and live a long life, a poisonous snake was taken to the island with a basket of grape where she was bitten and died. There are some sources that suggest some rebuilding of the fortress was done, most likely during the reign of Leo I of Cilician Kingdom of Armenia in 1199, and the stones that were used were actually from the previous building. Having its glory, there was a decline in 14th century, and as the Kingdom was on the verge of collapse in 1361 Peter I of Cyprus captured the island at the request of the inhabitants. Also, Robert of Lusignan was dispatched from Cyprus to administer the port, and with Cypriot assistance the residents of Korykos were able to repulse a Karamanid attack in 1367. 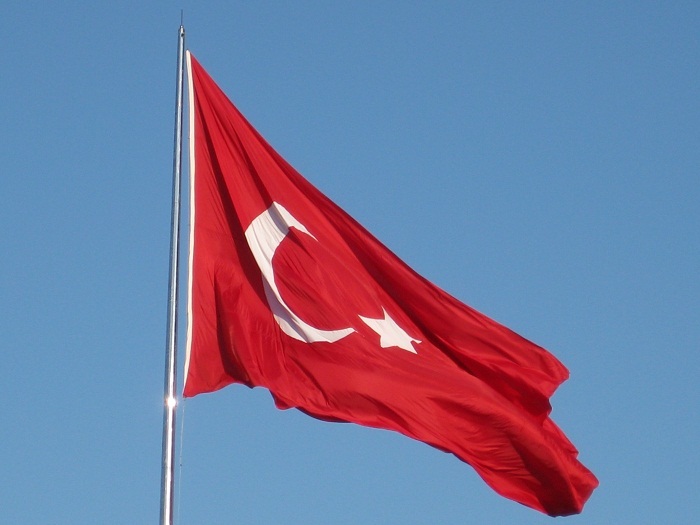 Still, undoubtedly a place of considerable strength that had enclosed double walls, each of which flanked with towers, then surrounded again by a moat, gave up in 1471 when Gedik Ahmet Pasha of the Ottoman Empire successfully conquered it. 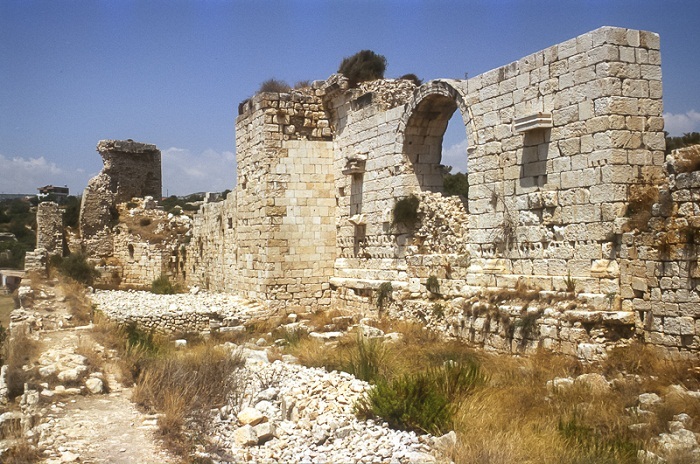 Today, the ruins of the city are extensive, among which there are a triumphal arch, a necropolis with a beautiful Christian tomb, sarcophagi, etc. The two medieval castles, one on the shore, the other in an islet, connected by a ruined pier, are partially preserved. 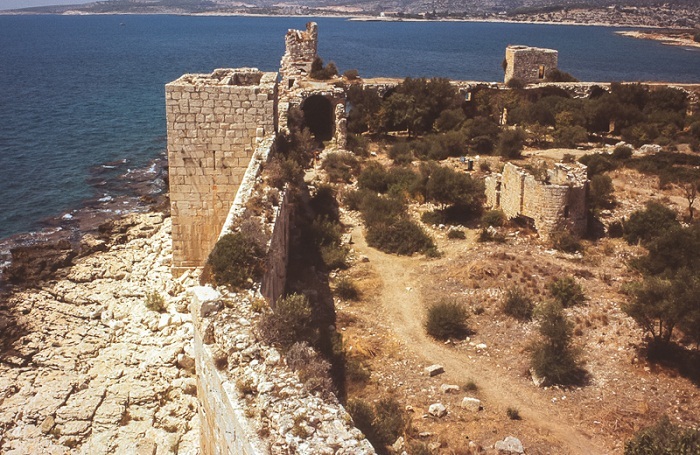 The walls of the castle on the mainland contain many pieces of columns and a mole of great unhewn rocks projects from one angle of the fortress about a hundred yards across the bay. Three churches are also found, one decorated with frescoes. The walls of the ancient city may still be traced, and there appear to be sufficient remains to invite a careful examination of the spot. 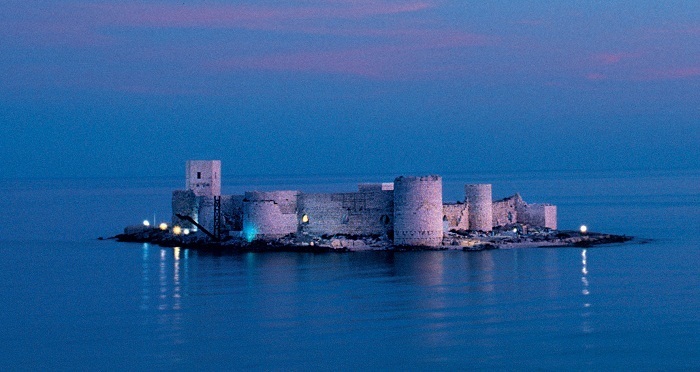 Since Kızkalesi Castle is protected by a natural water barrier as well as the formidable shoals of the island, the Byzantine constructed only a single, somewhat geometrical circuit with square towers. The smooth ashlar in the castle consists entirely of materials taken from the neighboring abandoned late antique city. This original construction survives only at the south and east and is in sharp contrast to the Armenian reconstruction (with rounded salients) at the northwest. 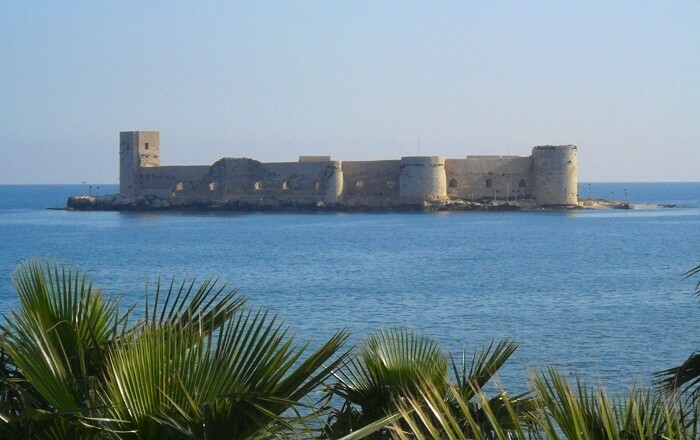 Together with the opposite Korykos Castle on the mainland, this sea castle protected the port of Korykos and of course their histories are linked closely together and almost identical. Nowadays, visited by tourists for a small entrance fee, every visitor will feel the spirit of the castles, the tumultuous history both castles had and get inspired to tell the story to everyone who would like to visit them.